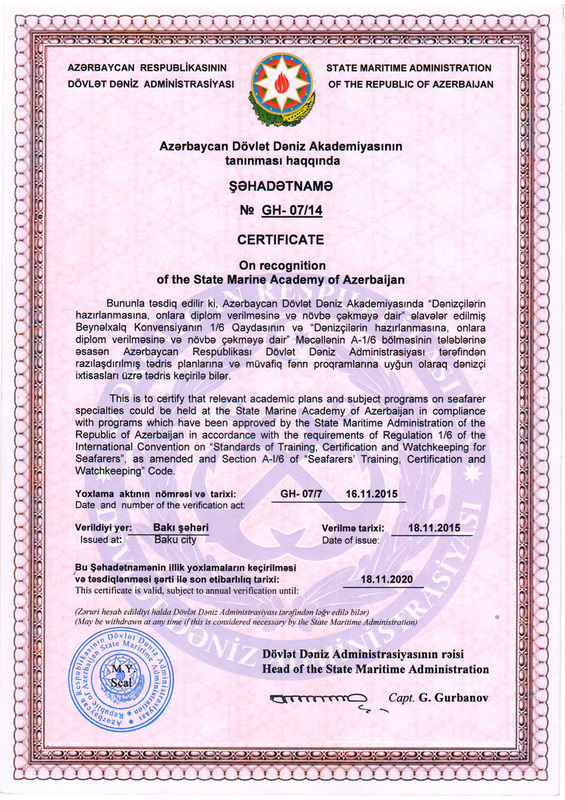 Azerbaijan State Marine Academy was established on the basis of Baku Waterways School in accordance with the resolution no. 91, dated July 15, 1996, issued by the Cabinet of Ministers of the Republic of Azerbaijan. The "Marine techniques and shipping" faculty is functioning since that year. 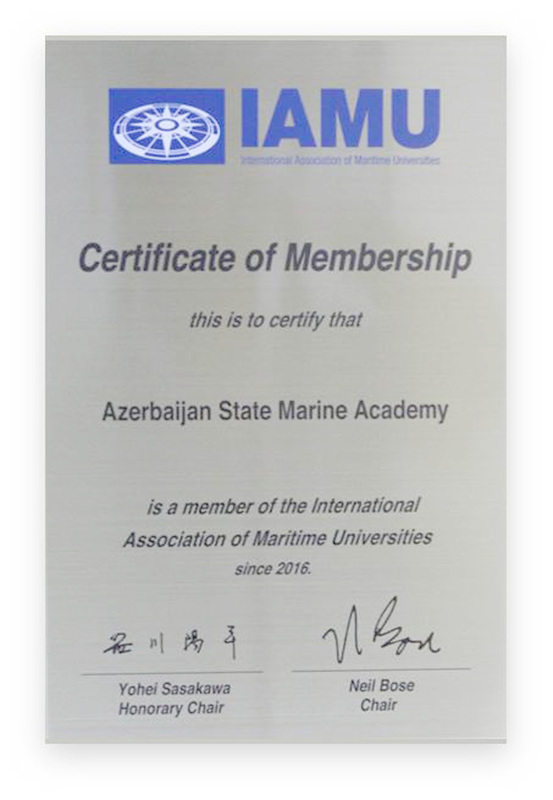 "Shipboard mechanics" "Marine navigation" and "Shipboard power engineering" faculties were established at the Academy on the basis of "Marine techniques and shipping" faculty in 2015. At present, 455 students are studying at the bachelor's degree of "Ship mechanics" faculty (394 of them are attending open and 61 are part-time students). 15 students at the Master's degree and 11 doctoral candidates are elaborating on their postgraduate thesis. "Shipboard power equipment" sub department of the "Shipboard mechanics" faculty was founded in 1996. 5 of 18 educators employed at the subdepartment are senior lecturers. The graduates of the subdepartment are sent by designation to work at various subordinated institutions of "Azerbaijan Caspian Shipping" Closed Joint Stock Company and hold positions such as engine room officer, engineer, chief engineer etc. In addition, graduates of the subdepartment work as an engineer and a chief engineer in the vessels of companies and firms of foreign countries. The scientific research works are being carried out on the topic of improving the efficiency of resources of the ship's power plants and their exploitation efficiency which are equipped on transportation ships and improving the economic, energy and ecological characteristics of the ship's diesel engines by improving the operational efficiency and regulating operational parameters. At present, research works are being performed for the purposes of detection of reliability extent of the rudder by means of diagnostic testing of vibration speed, vibration acceleration and other parameters of certain rudder equipment installed on the tankers (such as "President Heydar Aliyev", "Jalil Mammadguluzada", "J.Hashimov" etc.) 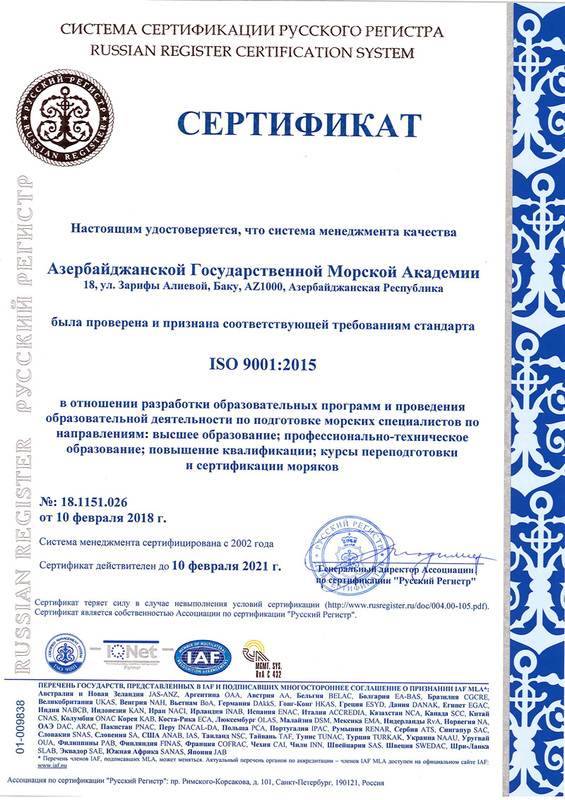 of "Azerbaijan Caspian Shipping" CJSC. In addition, the test parameters of the diesel engines 2Ч 10,5/13 and 2Ч 9,5/11,0 were tested on the testing equipment to determine the impact of these parameters on the economic, energy and environmental characteristics of the engine using the engine parameters (fuel injection angle, start-up pressure, cooling fluid temperature, etc.) mathematical research has been completed with the help of the mathematical model, however the engine tests are being continued. "Shipbuilding and ship repair" subdepartment of the "Shipboard mechanics" faculty was founded in 2002. 3 of 14 educators employed at the subdepartment are senior lecturers. 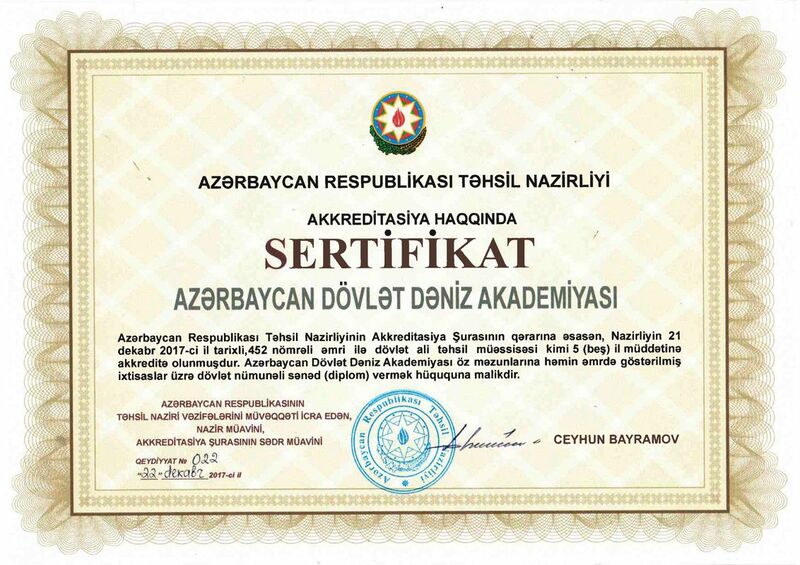 The graduates of the subdepartment are sent by designation to work at various subordinated institutions of "Azerbaijan Caspian Shipping" Closed Joint Stock Company, including shipbuilding and ship repair yards and hold positions such as engineer, technologist etc.at those facilities. In addition, graduates of the department work as engineers in shipbuilding and ship repair facilities of companies and firms of foreign countries. In the direction of "Shipbuilding and Ship Repair Technique" state budget research works are being carried out on the issues of analysis and improvement of the operating conditions of cylinders, and their manufacturing and recovery technologies improving the performance of ship engine components. "Applied Mechanics" subdepartment of the faculty was founded on the basis of the "Mechanics and Mathematics" subdepartment in November 2017. There are 3 professors and 17 senior lecturers out of 25 educators employed at the subdepartment. The subdepartment is one of the main subdepartments conducting common education at the Academy and besides other fundamental disciplines (such as mathematics, physics etc. 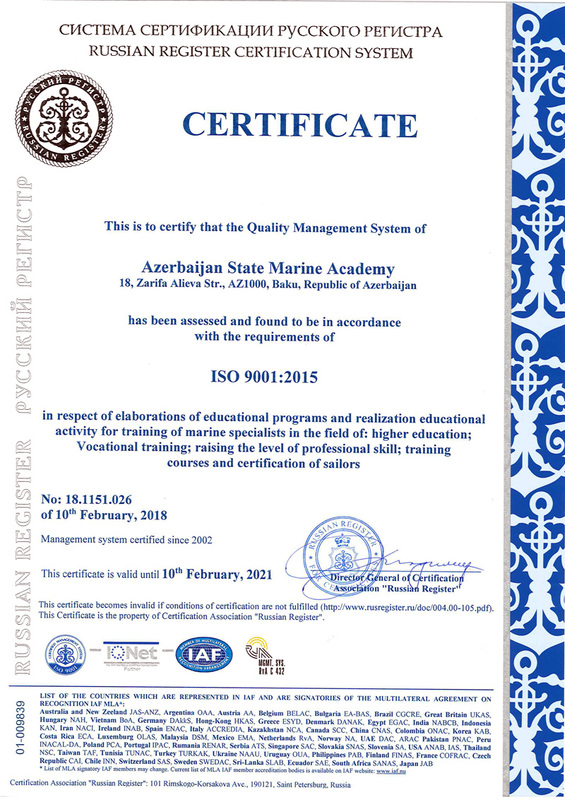 ), the subdepartment teaches other general specialization subjects such as "Theoretical mechanics", "Applied Mechanics", "Mechanics of materials", "Materials science and engineering", "Theory of Machines and Mechanisms", "Metrology, standardization and certification", “Computer technologies” for all specialities and directions for the training of marine transportation specialists either at graduate and post graduate level of higher education. Classes of the subdepartment are conducted in the specialized laboratories of physics, materials resistance, fundamentals of machine parts and construction, a theory of machines and mechanisms, Metrology, standardization and certification and Materials science and engineering, as well as, in other specialized laboratories equipped with modern computer technology and multimedia equipment, which meet up to date requirements. 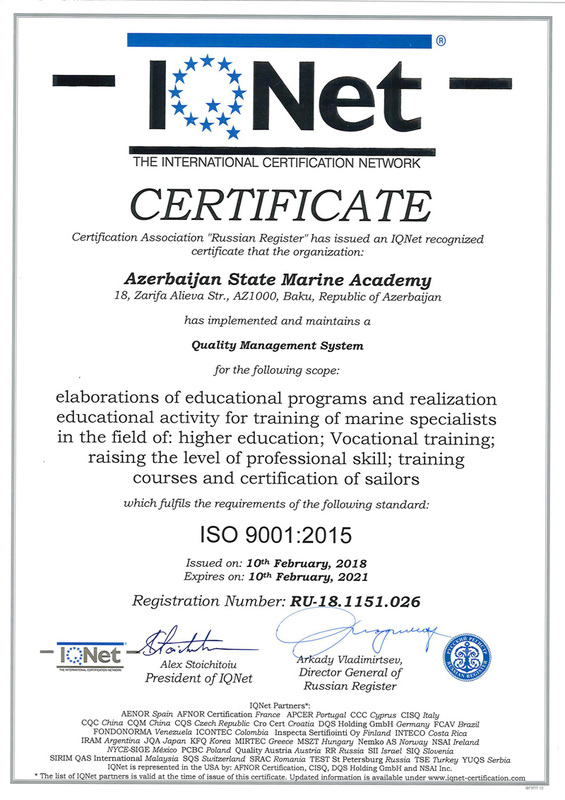 In the department, scientific research works are carried out for the shipping industry of "Azerbaijan Caspian Shipping" CJSC in the field of fundamental sciences such as physics and mathematics and in the sphere of crucial aspects of the shipbuilding and ship repair. Various scientific research works are being conducted in the subdepartment which relate to the creation of physically and mathematically justified mathematical model, on the basis of the mechanics of fluid, gas and plasma, describing the hydrodynamic processes around the vessels in various operational conditions, determination of equation for the new state solution of the liquid mixture in the form of exponential and strength function by means of implementation of liquid and gas environment mechanics methods and studying basic laws of sound disspipation and extinguihing within sea water, the application of the antifriction coating on the outer surface of the cylinder line bores, evaluation of the effects of the cylinder-piston group on the resource and cavitation resistance of restored cylinder bore lines, the the chemical-thermal processing of the ship's engine details in order to increase the lifetime of the engine, theoretical and experimental justification of the restoration technology of engine compenents (such as cylinder grooves). Scientific research works are also being performed in the sphere of fundamental sciences (the acquisition of semiconductor electrodes containing electrophysical properties of semiconductor components directed towards the acquisition of new materials used in modern electronic devices and technology).